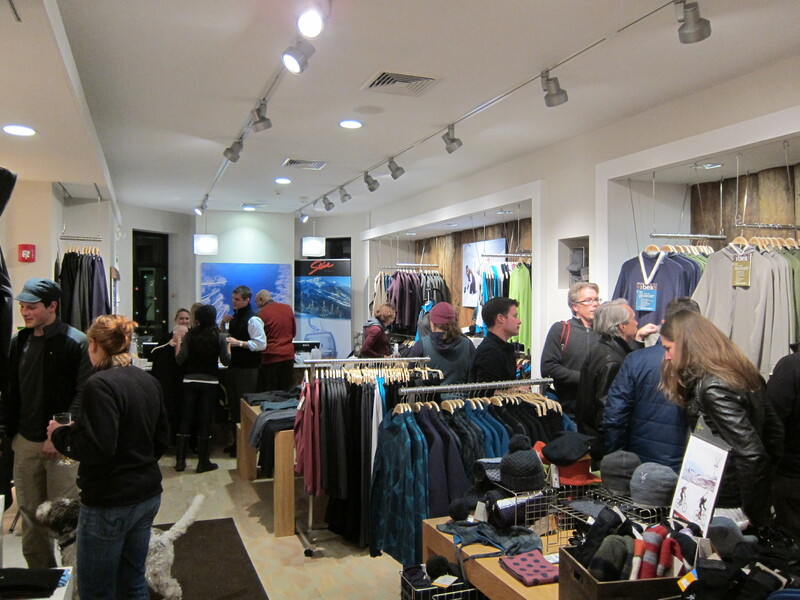 An excellent night was had by all that attended the Winter Warming event at the recently opened Ibex store located at 303 Newbury Street. 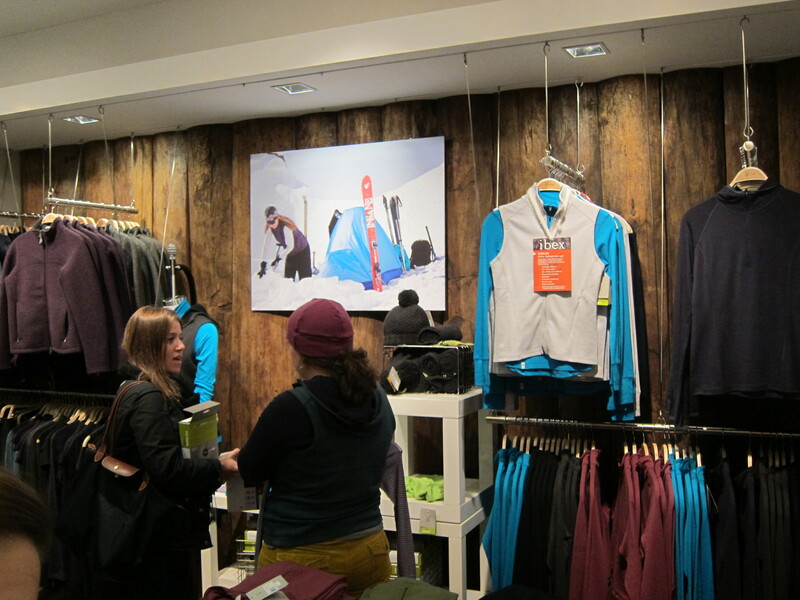 Many folks were taking advantage of the 20% off the entire store last night. I meant to pick up a very nice piece for my wife, Leigh, but I got caught in the moment and left without it….boo. I met some great people last night and reconnected with others. It was a pleasure to meet Julie (@verdejulie) from Verde PR as she did an excellent job packing the store. Although, having American Flatbread Pizza with their mobile brick oven parked out front didn’t hurt along with the VT beers flowing and of course Hot Toddies. Anyone have a photo of the oven set up to share? If so, please add to comments. Many faces from the Ibex family including the Top Sheep himself graced the store with their presence and their welcome smiles. The social media presence was also well represented and pictured below: @swimmykimy (Kim), @bostontweet (Tom), Ally, @foodtorunfor (Liz), @boloco (Sara-in background) amongst other I may have not met. I suggest you drop into the store before your shopping is complete for the Holidays. If you are anything like me…I tend to buy gifts that will last many years and Ibex is no doubt an investment that keeps giving back for years. 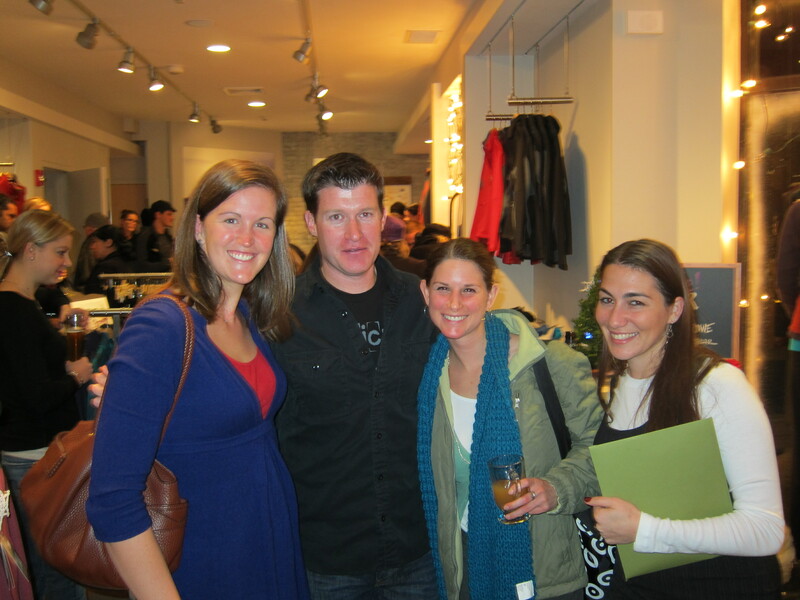 Thank you to Ibex for hosting such a great event with fun people and local VT food and drink. sidenote: This time I made it home without hitting the pavement. 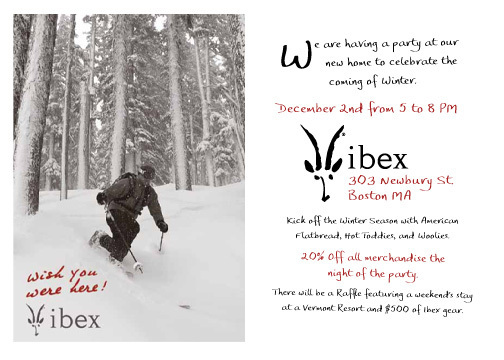 Please join me in celebrating the coming of Winter Thursday, December 2nd at the Ibex Flagship store, 303 Newbury Street. Be there for your chance to win a weekend for two at Stowe or score the $500 Ibex gear upgrade. Local beer and wine to be served along with American Flatbread Pizza bringing their tastiness down from VT. Great opportunity to pick up a holiday gift that will be around for many more holiday seasons. Ibex is generously offering 20% off the entire store which includes merino wool and organic cotton product lines from 5-8pm.